Ouch! No one wants the pain and inconvenience of a cracked tooth, so in this Providence Dental dental blog post we are going to focus on how to avoid this preventable problem. The first thing to remember is that avoiding a cracked tooth is not rocket science. 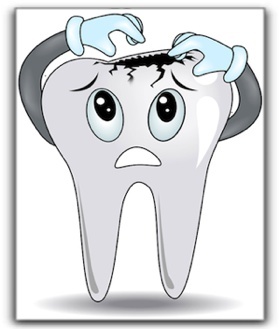 Steer clear of chewing on hard things if you don’t want a cracked tooth! This includes ice, hard candy, and (sorry movie lovers!) popcorn. Also, protect against any impact to the mouth that could be experienced during sporting events. If you are a member of a local Providence or NW Las Vegas rec center basketball, ultimate frisbee, or flag football league, pick up a mouth guard at a sporting goods store. Be sure to keep your regular check-ups, because we can spot possible problems that could predispose you to a cracked tooth such as an uneven chewing surface or brittle teeth. If you have a cracked tooth, you’ll want to pursue the correct course of treatment and, if needed, explore some cosmetic dentistry procedures to fix any visible damage. These include veneers, a porcelain crown, or a dental implant. Call Providence Dental in Las Vegas to schedule an appointment today. And watch out for those hard objects!